1 - Day live class in London SE16, England. 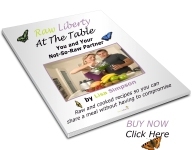 With Lisa Simpson, RawLiberty - Raw Food Coach and Chef. This class is ideal for those people who are searching for ideas and inspiration to help them live harmoniously raw in a cooked food home. Are you struggling to stay raw, when everyone around you is eating cooked food? Have you wondered how on earth to prepare two different meals (or more) that everyone will love? Have you wondered if you need to sacrifice or limit your raw food journey in order to keep your partner happy? Are you ready to learn how to make delicious raw recipes for you, so that you can still share a meal with your loved ones? There are a lucky few who go and stay raw with their partner, but in my experience these lucky people are in the minority. Staying harmoniously raw in a cooked food home can seem daunting at times, and can be a challenge especially when it comes to preparing different meals for yourself and your family. However, I have good news for you; this couldn't be further from the truth! It is possible, there is no need to compromise; it just takes a little more time and organisation than if you were all eating the same food that's all! Join Lisa, in her wonderful new venue, with good parking and convenient to transport links as she shares with you some truly delicious raw versions of cooked recipes that will enable you to live harmoniously raw with your not so raw partner! That's an incredible 15 recipes that will be all yours - enabling you to easily incorporate raw meals into your cooked food home! ·	Access to The Raw Liberty Shop to browse or buy foods, products etc. Location: Norley, Frodsham near Chester. be free to let your true self shine? become your ideal weight, naturally? This class is appropriate for those new to raw as well as those already experimenting with raw food, and those looking for raw inspiration. The content of this amazing day is worth well over £100 but when you sign up to this class it’s all yours just £70 per person providing you with excellent value for money! The class is limited to just 6 places so don’t miss out on the fun! Email me lisa@rawliberty.co.uk for booking details. "I attended Lisa's raw food class and had no idea what to expect. Any apprehension I had soon vanished immediately with Lisa's warm welcome. Lisa's teaching style was very friendly and easy to follow, she allowed plenty of time for questions and was very generous with her knowledge, sharing lots of hints and tips and offering variations on recipes being prepared. The food Lisa made was a delicious feast and although I had disastrously tried to make flax crackers before and vowed I wouldn't bother again, Lisa's were so delicious I went home and made my own and they too were delicious!